Mga mare, here's a quick "Beat the Heat Treat" giveaway for all of you. My mommy friends were lucky to experience a special staycation at F1 Hotel Manila with our families last November (Read our #FamilyFunAtF1 experience here). Besides the great bonding time we had, we were also given gift certificates to share to our lucky readers. Perfect ito, mga mare! Escape this unbelievable heat with an overnight staycation at F1 Hotel Manila. Enjoy the coziest rooms and beat the summer heat with unlimited swimming in one of Manila's premier hotels. 3. Like Nanay's Trip on Facebook. 6. Leave a comment below and share why your family deserves a summer overnight staycation at F1 Hotel Manila. Please include your full name and email address in your comment. This giveaway will run until April 24 11:59PM. Our family will choose one (1) winner. I'll send an email to the lucky winner and will post the good news here on the blog too. F1 Hotel Manila is located at 32nd street, Bonifacio Global City, Taguig City. For inquiries and reservations, please call (02) 928-9888. For online booking and more information, please visitwww.f1hotelmanila.com. For hotel updates and special offerings, follow F1 Hotel Manila on Facebook, Twitter and Instagram @f1hotelmanila. My family had been through a lot this year. May mga ka pamilya na nawala sa buhay namin at may matinding karamdaman na hindi inaasahan. Nawalan na kami ng oras at budget mag celebrate ng birthdays at graduation. Sana, kahit isang gabi, makapagsaya naman kami sa F1 Hotel. Change in location can bring about a change in perspective. Para mare charge at ready ulit sumabak sa challenges! We wanted to take our youngest son on a stay-cation for his birthday last March 28, we had to give up that plan so we could use the money to get him a check up with a developmental pedia which we were trying so hard to get an appointment last year. When we finally got his check up, he was diagnosed to have ASD or Autism Spectrum Disorder. Yung speech nya pang 12 months na baby lang kahit he just turned 4 years old last March. My son loves the water and he loves to swim, Calel (my youngest) deserves to win this vacation dahil I know swimming that pool, plus a comfy bed always makes him happy. He loves stay-cations and I hope this could be a belated birthday treat to celebrate his path to getting better and also for my husband and daughter who will devote our time as well as love with coping with his condition. My husband has a demanding work and we're helping two families (ours is excluded, total of 3) that's why staycations and the like were not our priority. I hope we'll be picked so that we can have first stacaytion. Our Elijah will surely love to dip in the lap infinity pool of F1 Manila. We never had a chance to have a vacation since my son was born. Since we're just starting to build our family, we make sure that our money is only allocated to the necessary things, so we never had a chance to experience such luxury. Last 2014, my son was diagnosed with seizure disorder. Being a first-time mom, it was very traumatic for me since I failed as a parent. Since then, I told myself that I would really work hard to provide my son the best things in life. I would work hard to give him the life he deserves. Winning this would be a great opportunity for us to celebrate the challenges that we've surpassed. If everything turns well, he would be graduating from his maintenance medicines this year, which is something that I really pray for. It would also be a great way for us to celebrate our transition to parenthood, something that we have never done before. And finally, this would be a chance for us to have our very 1st family trip / staycation. My son loves the water and he's fond of splashing all over during bath time. It would really be a heartwarming experience to see him enjoying the water beyond the confines of a tub. Our family deserves to win an overnight staycation at F1 Hotel Manila because my family is simply the best! My husband and I just got married last January 2016 and I am also a mom-to-be very soon! They're all very supportive to me and my partner. I just want to reward my family something fun and exciting this summer because I know they deserve it. In exchange for all the sacrifices that they've done for us, for all the joy, compassion and wisdom that they've given us. So, winning this giveaway is truly one of the amazing gifts that I can give to the whole family. Our family deserves this staycation so we can spend more time together. My husband has a very hectic schedule and I would like to dadnap him from his work at least for us to have more quality time together. Next month is going to be his special day and I this staycation is going to be a great gift for him. Our family had many milestones in the past months--my daughter's Kinder Graduation, my husband and I worked hard and pursued some projects as choristers, and us three have been busy with churchwork as volunteers especially during Holy Week. What better way to celebrate these than with this staycation in F1 Hotel Manila. 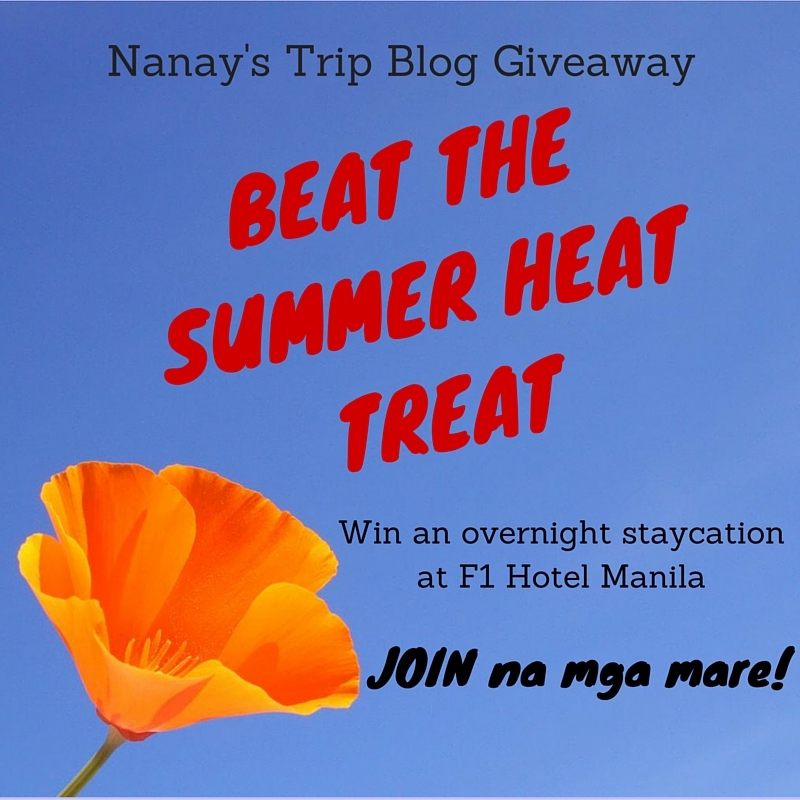 Me and My Family Deserve a SUMMER OVERNIGHT STAYCATION at F1 HOTEL MANILA. Because we need to take rest to all trials we encountered even though for 1 Night only. At least we enjoy our night at F1 Hotel. since its April , its my birthday month too. This Giveaway of yours Mommy Nanay's Trip will end April 24, 4 days to go that's my birthday. We have been having a rough time and adjustment since the start of the year. Although this is something that could break us we manage to still find happiness in every situation. Enzo being the sweetest becomes our strength and our motivation. this staycation will definitely bring and create more bonding and moments as a family. A timely summer giveaway for families. The reason why I join and hoping to win in this giveaway simply because of my little man, Yvan. We celebrated his 4th birthday this month to the simplest party we can give. My son is a fighter and miraculously living for four years now battling with his lung condition and just last year diagnosed to have bilateral hearing loss. The perfect gift we can give to Yvan right now is providing him a complete set of hearing aids. That being said, it is expensive that we can't afford to pay for a hotel room for now but God answered our prayer, we are able to saved for his hearing aid. He can now hear us bit by bit we are coping and started to have his speech therapy. Thought of Yvan and his siblings loves swimming, and staying in a hotel will give us enough relaxation and calm of mind even for just one night. Who ever wins I know they deserve it. Good luck to all of us. Thank you Mommy Nadia for this lovely summer treat. My Family and Me deserve this SUMMER OVERNIGHT STAYCATION at F1 HOTEL MANILA. First of all, I would like to thank Nanay Nadia for running a giveaway like this! 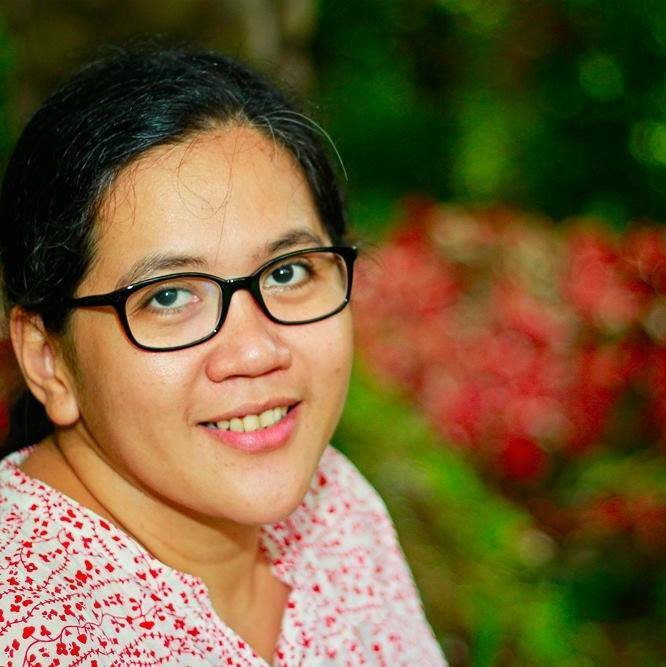 Thank you po Nanay Nadia, for sharing your blessings with us (your readers). I think each and one of us deserves to win. 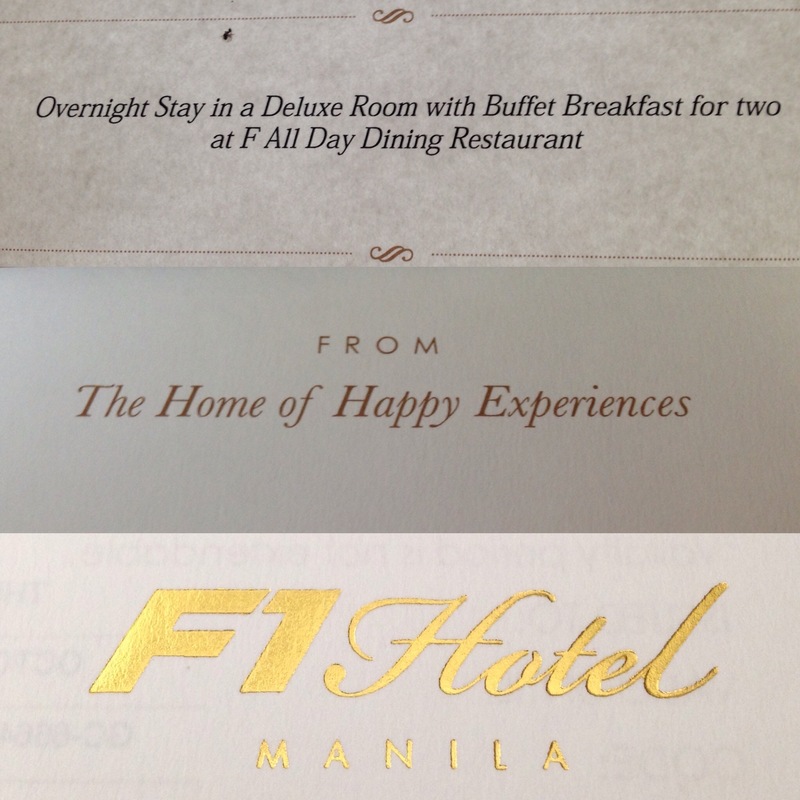 Who wouldn't want a free overnight stay in a luxurious hotel like in F1 Hotel Manila? Of coarse, we all want to win and experience it. Each of us has there own unique reasons why we deserve to win, and I am one of the hopefuls and will try my luck too. My family deserves a summer overnight staycation at F1 Hotel Manila for free because every summer, we don't use to go out (yeah, seriously) because I think going out is just a waste of money. So, my kids are just enjoying the whole summer at home. Swimming outside using a batya or baby's bath tub, having some snack or doing some arts and crafts at home are some of the activities we use to do every summer. My husband's birthday is on May 5, Mother's Day is on May 8, May birthday and our wedding anniversary is on May 17 (yes, it's quadruple celebration for us) and we want a very romantic yet memorable experience/celebration with my husband and our two kids in F1 Hotel Manila (if papalarin). Thank you po uli Nanay Nadia! God bless you and your whole family! Staycations are a great way to relax, enjoy and celebrate. I'd would love to win this giveaway for our family to have a chance to also connect with each other. I am a stay at home breastfeeding mom and my husband works hard to provide for us. We are going to celebrate our 2nd wedding anniversary next month and spending time away from our usual routines would really be a great way for us to feel the kilig moments again. Sometimes, we are so focused on being parents that don't spend quality time as a couple. Also, I'd love to celebrate having breastfed my daughter for a year! I am so thankful that God gave me a supportive husband that helped me during the difficult time in my breastfeeding journey. If I win, I'd surprise him with this summer treat as an advanced birthday gift since it's also his birthday next month! Thank you very Ms. Nadia and F1 hotel for this giveaway!